My denominational tradition – the Christian Church (Disciples of Christ) – doesn’t call its “judicatories” bishops. We call them General Ministers and Regional Ministers. We sometimes jokingly call these leaders bishops, but we don’t generally assign them the same kind of authority that a bishop in a Methodist, Episcopal, or Catholic Church would. For the most part we assume that these leaders, both in regional and general expressions provide spiritual leadership and administrative leadership, but do we affirm another aspect of leadership that traditionally was assigned to bishops – that is the teaching office. Disciples embrace the idea that we all have the freedom to explore the scriptures and interpret them. We don’t assume that pastors, even highly educated ones, have the right to define the faith for the people. Preachers can preach and teach, but how much authority is accorded them. For the purposes of our ongoing conversations about church polity – and Disciples polity as almost as flat as anything Tony Jones can envision – can we conceive of our regional and general leaders being called to a teaching office? Years ago, Michael Kinnamon was nominated as General Minister and President of the Christian Church (Disciples of Christ). He was and is a teacher. He has held administrative posts (General Secretary of the National Council of Churches for instance). Had he received the necessary two-thirds vote, would we have accorded him this role? Would we have expected him to interpret the faith in an official capacity? We have the several branches of our function, both as to preaching and governing, very solemnly laid upon us. And both in this office, as well as in all the other offices that I have seen, it appears, that the constant sense of all churches in all ages has been, that preaching was the bishop’s great duty, and that he ought to lay himself out in it most particularly. [Gilbert Burnet’s Discourse of the Pastoral Care, edited by Robert D. Cornwall, (Lewiston, NY: Edwin Mellen Press, 1997), p. 141]. Yes, when we gather at General Assemblies the General Minister preaches (often it is more a report on the state of the church and not a teaching moment), but do we expect the same of our Regional Ministers? Do we expect them to not only visit and assist, but bring a word from God to the congregations, teaching the churches the things of God? 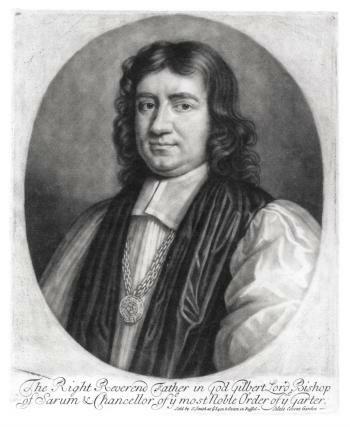 For Burnet, it was assumed that a primary vocation was to study the Scriptures and bring interpretation of them -- do theological work for and with the churches. Is that our assumption? Bob, I suspect that even in the most Disciples-ish of regions, there's still a strong influence of "state evangelist" in the congregational perception of our regional ministers, aka bishops. Our senior staff person in most states was titled "Evangelist So-and-so" until a hundred years ago, and many state societies (such as the Ohio Christian Missionary Society) had staff evangelists until 70 years ago or so. These folks had two (well, three) actual functions: they preached to pull in an audience for new church starts, they preached to draw in the community for revivals, sometimes a missions oriented revival, but revival meetings for a week of evenings or so at an existing Christian Church, and they were the person you contacted when you were looking to make a move (if you were clergy; it was the evangelists and the college presidents who knew what was open and what was opening), or if you wanted to call a new preacher (if you were a ruling elder in a congregation, a largely life-tenured lay leadership position in the local church, whose grip on calls and contracts was part of what Restructure was designed to counteract). Anyhow, this was a robust model for us from about 1830 to 1950, so it's no surprise that sociologically, it's still strong even if relabeled. We don't have a healthy sense of a teaching office tied to that role, since their task is more one of exhortation (in our history, that is) than of instruction or even of counsel. And it's still the case that if you want to get a congregation to listen to you as a regional staffer, the best case scenario is that you come, preach their socks off, then meet with whatever the concern or committee is after lunch -- because that's what we're subtly conditioned to respect. Teaching can be threaded back through that paradigm . . . but I'm going over all this history because my own sense is that, despite what folks like Ron Allen & Clark Williamson tried to do in the 80's & Michael Kinnamon in the 90's and after, the model of "the teaching minister" let alone the teaching bishop is still an "ex nihilo" experience for many life-long Disciples & congregations led by them. Jeff, thank you for your reflections -- helpful remembrances of the old systems. And mention of college presidents and deans is important. As a graduate of Northwest Christian University -- the President and Deans did function in this way for both the Disciples side and the Independent side. As a pastor with a Ph.D. who was a college/seminary professor before coming to the pulpit full time, it is the teaching ministry that is closest to my heart, but many congregations find it difficult to invest that in a pastor. Unfortuantely pastor as therapist is more popular than pastor as authoritative teacher.